September 12, 2016, 1:26 p.m. The weekend before last saw thousands of people take to the streets across the country in a March for Europe, calling for the UK to strengthen its ties to Europe following the Brexit vote. A couple of days later, MPs debated a petition that had gathered more than 4 million signatures calling for a second referendum on the UK’s membership of the European Union. It is unlikely that either the marches or the petition will change the government’s stance on Brexit, but a lot of people clearly believe there might be a chance that they will. A new YouGov survey now shows the extent to which people believe that political activism is effective at changing the way the country is run. 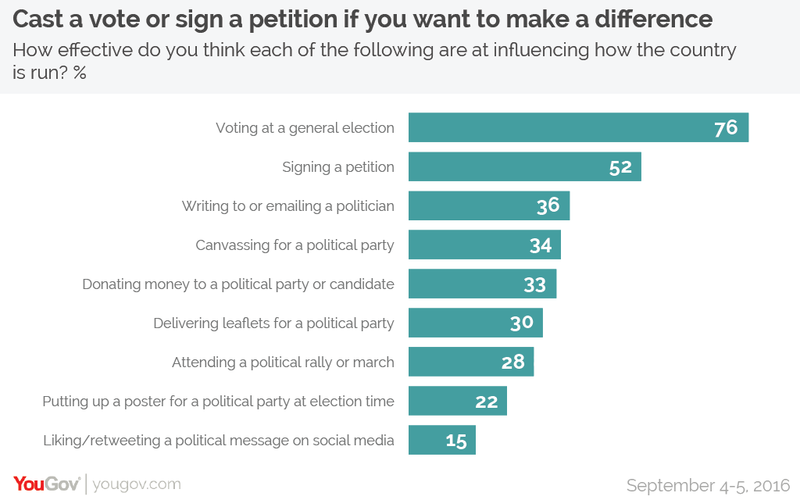 Just two activities are seen by the majority of people as effective: voting at a general election, and signing a petition. A person’s belief in the effectiveness of political activism varies from party to party. Labour voters have the most faith in activism, with a significantly greater belief in the effectiveness of canvassing for a party (42% think it is effective), donating money to a party (39%), attending a rally or march (37%), putting up posters (29%), and social media (20%) than voters of other parties. Conservative and Lib Dem voters are much more likely to think voting at a general election makes a difference (88% and 89% respectively), whilst UKIP voters are much less likely (72%) – presumably because the party secured just one MP at the 2015 election despite receiving nearly 4m votes. Lib Dem voters are also much more convinced of the value of writing to MPs (51%) compared to other voters. Do you hear the (young) people sing? There is an interesting generational divide over how effective people think each of these measures are – but it’s not quite the one you might expect. Young people (18-24 year olds) are generally as or much more enthusiastic about their ability to influence government as the national average… but so are the very oldest people (65+ year olds). 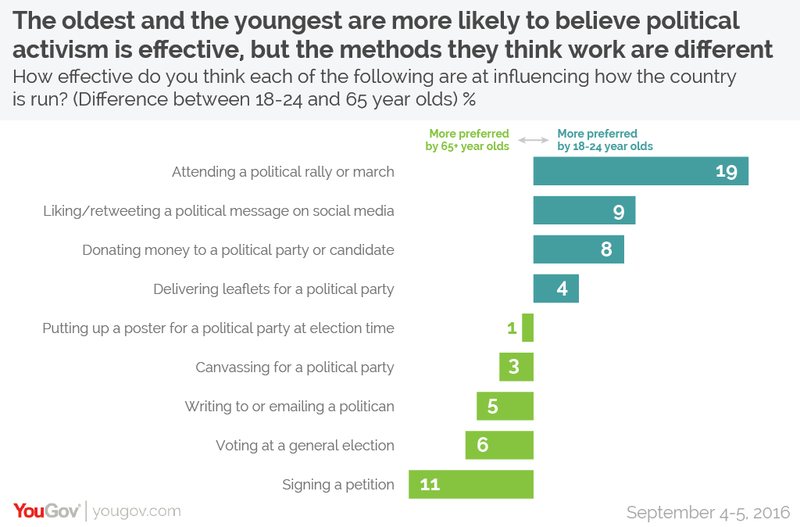 And whilst both age groups believe that political activism is effective, they differ in which forms of activity they think are most effective. Young people are vastly more likely to believe that political rallies or marches are an effective way of influencing the way the country is run. They are the only age group to think they are more effective than ineffective (44% vs 37%) – all other age groups are about twice as likely to say they are ineffective as effective. Young people are also the most likely to believe that donating to a party or liking/retweeting a political message on social media are effective – good news for the Labour party’s bank balance and twitter accounts. Old people by contrast are more likely to have faith in signing petitions and voting in general elections.